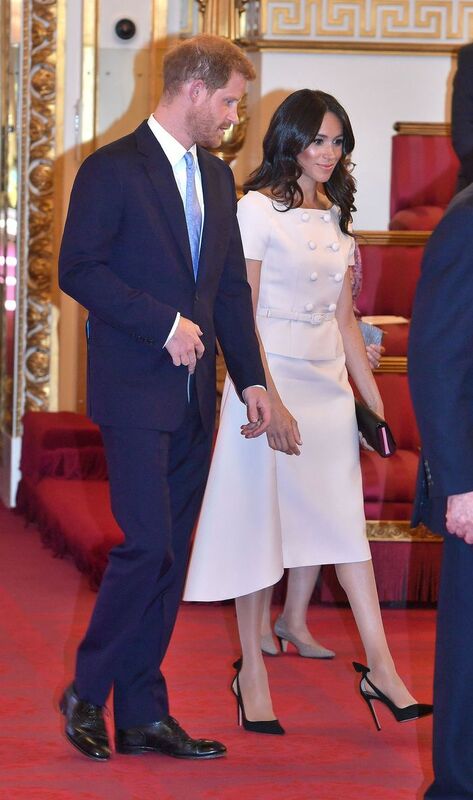 We've already discussed Meghan Markle's lovely Prada dress she wore to Buckingham Palace, so today we're turning our attention to her shoes. An editor at Elle UK pointed out that there's a very similar version to her $750 Aquazzura pumps hiding at Kurt Geiger. Not only are the Kurt Geiger look-alikes 18 times less expensive, but they're also about an inch lower than the royal-approved version, which is always a great thing in our book. Don't dally over the decision to add to cart though, as, like many a Meghan-inspired item, they are going fast! Scroll down to see and shop. Available in size 5 to 10. Next up, discover Meghan Markle's hack for avoiding blisters.